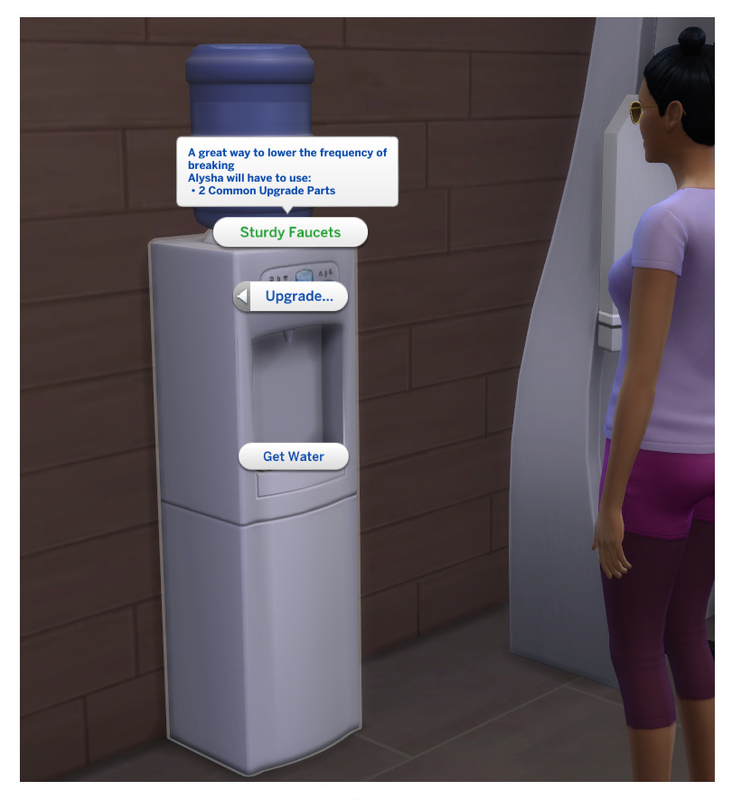 With the ability for our Sims to get glasses of water from sinks now, I thought it would be a neat idea to create a functional water cooler for our Sims that would fit in well in offices or at gyms. It's taken me quite a lot of work to get this to a point I'm happy with releasing. I think it's the first object that I have ever meshed, mapped, and textured all from scratch. 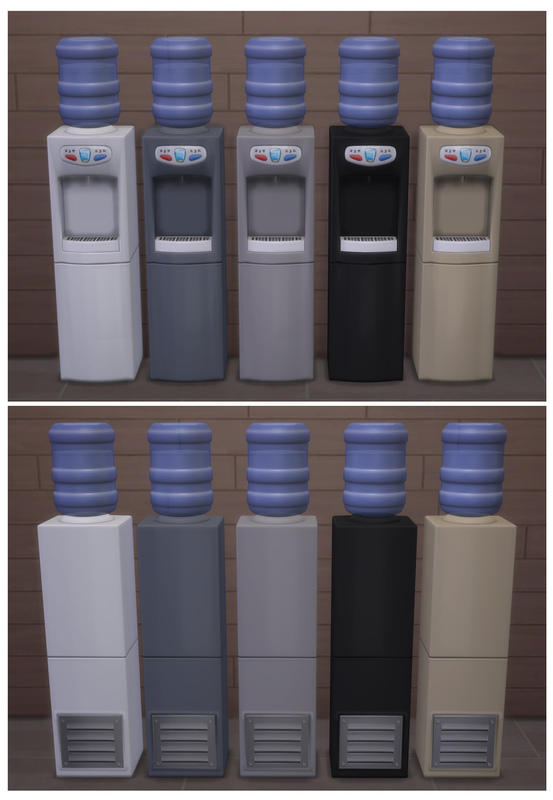 The Aqua Pura Water Cooler, as it is named in the game, can be found under the Kitchen Appliances sort for a cost of 215 simoleons. It is also tagged to show up in the Lot specific catalogue sections for Spas, Gyms and the Hospital if you use cheats to build there. It comes in four fetching shades of monochrome as well as beige, for a total of five colours. It features correctly animated water pouring. The cooler CAN break and has the same probability of doing so as a sink (as that is what this object technically is with a few options removed). 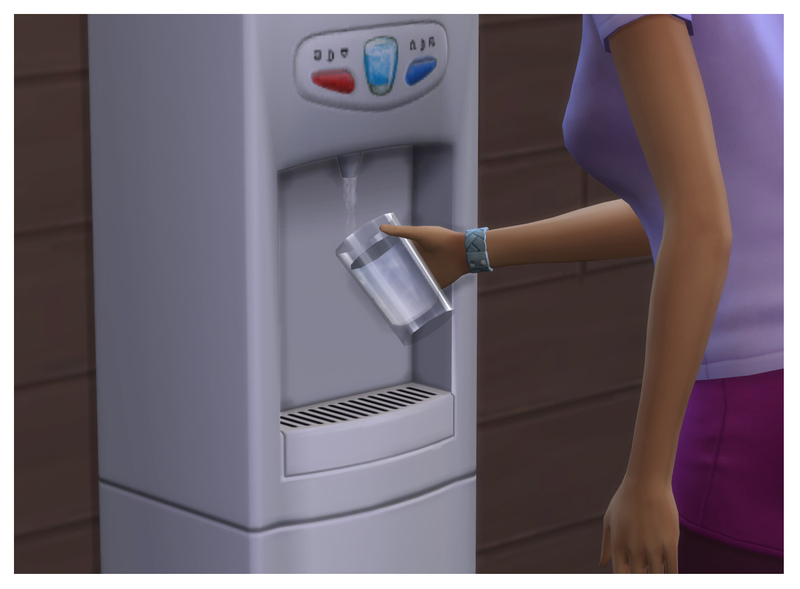 The cooler can be repaired by your own Sim or you can call a repair techinician. The insta-replace option also works. 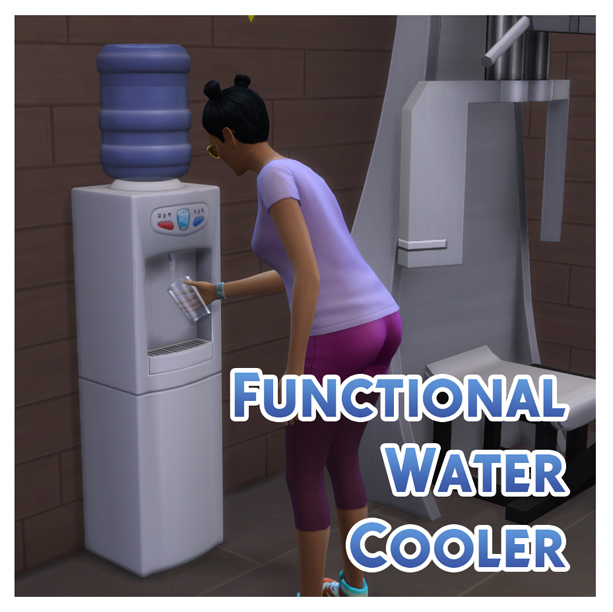 There is also the option to upgrade the cooler with Sturdy Faucets to decrease the rate at which it will break if your Sim has the required Handiness skill. When repairing the cooler, Sims will just sort of play with a wrench in front of it without actually using it ON the cooler. Check the screenshots. 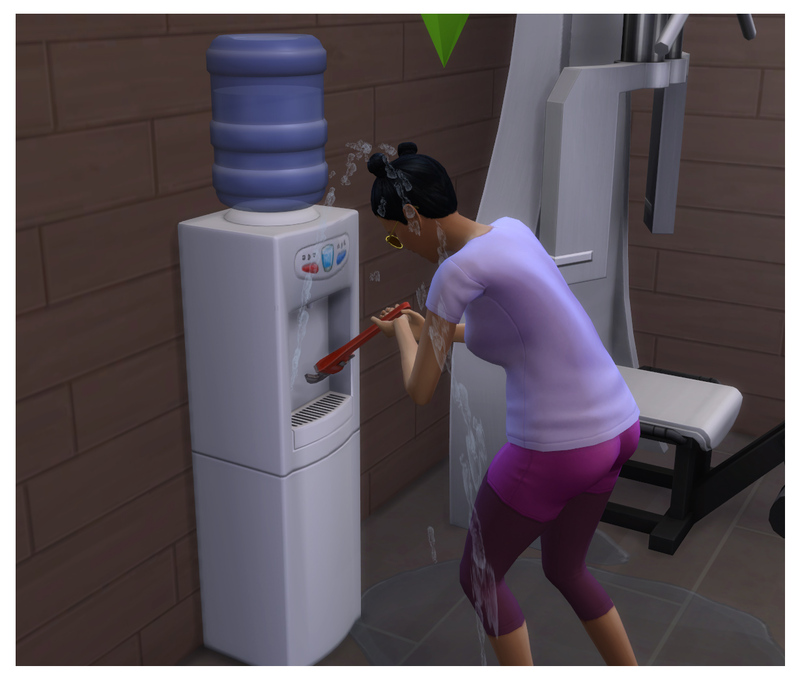 So basically how Sims fix a sink by sort of waving the wrench about in the basin. The cooler uses its own unique tuning so shouldn't conflict with any other objects or mods. The desire to grab a drink from the cooler is the same as grabbing a drink from a sink as I haven't altered that. 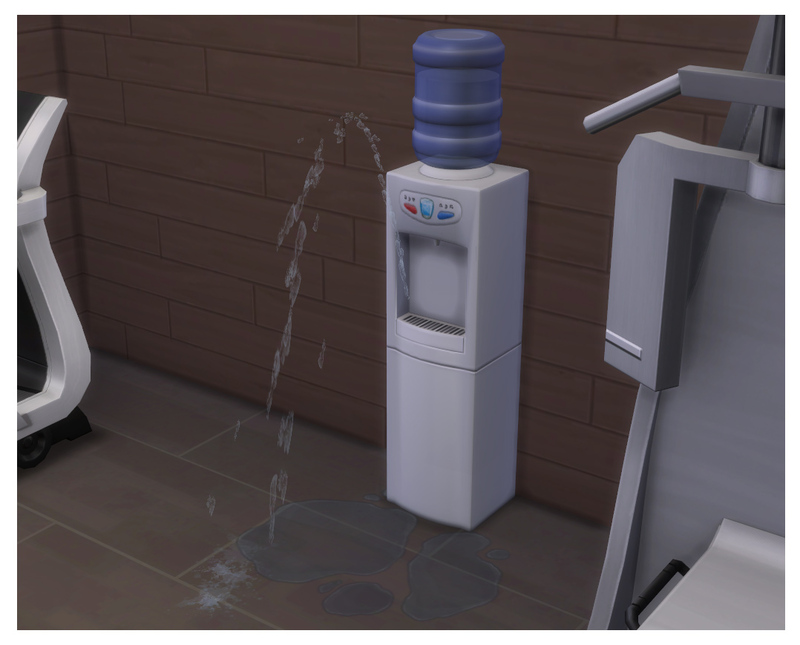 MisterS and inabadromance over at Sims 4 Studio for their helpful tutorials and feedback. minttea for their explanation of the object specular.